Thanks to others like you we are the seventh most generous nation on the planet according to the Charities Aid Foundation (CAF). However, a staggering 90% of our charitable donations go to just 6% of the UK charity market – the medium-large organizations. So, how have we seemingly forgotten about the vast majority of the UK’s charities? We launched a new research report – The Forgotten 95%: The Truth behind Britons’ Charitable Donations – to find out. We asked 2,000 UK adults what inspires them to support a cause; what influences the charities they choose; and what is holding them back from donating to smaller charities. The fact that smaller charities are missing out on over two fifths of donations from donors was of course big news with national and trade press. At Givey we believe that all charities deserve a chance. 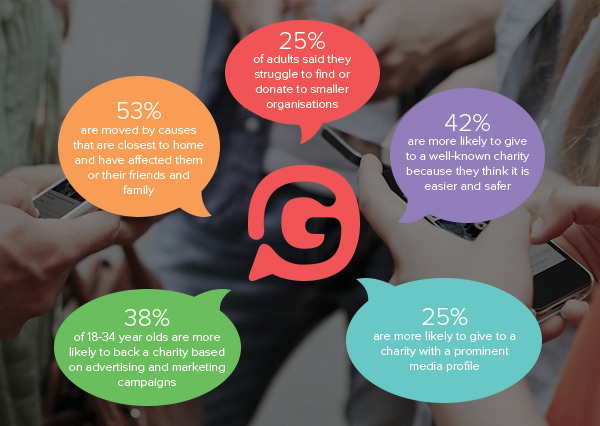 By creating a speedy and social online donations platform, Givey enables smaller sized organisations to amplify their worthy causes for free whilst making it easier for you to locate and support them. We also make sure that 100% of your donation goes to your chosen charity. So don’t let the majority of our charities be overlooked.